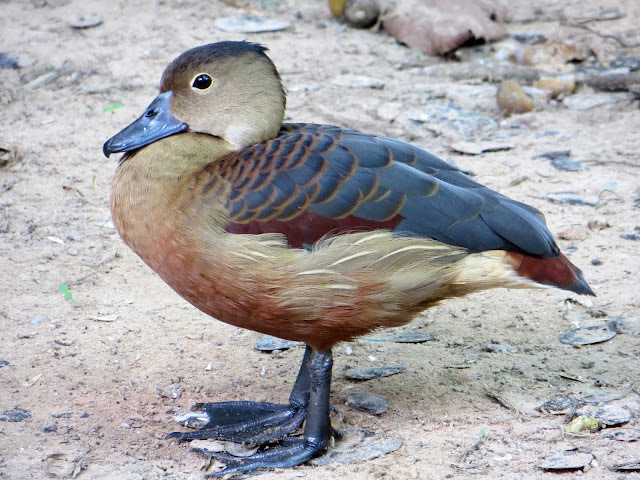 If you decide to tuktuk the 60 kilometres from central Siem Reap to the ACCB, the Angkor Centre for Conservation of Biodiversity, then make sure you allow at least an hour and a half for the journey. I made the mistake of leaving too late the first time I headed in that direction – and ended up exploring undiscovered countryside instead – no bad thing. At our second attempt, my tuktuk driver Bunsoth and I left town at 11am, so our ride out was leisurely and I had time for a quick snack of fried noodles at one of the local foodstalls before the ACCB’s daily (except Sunday) tour started. 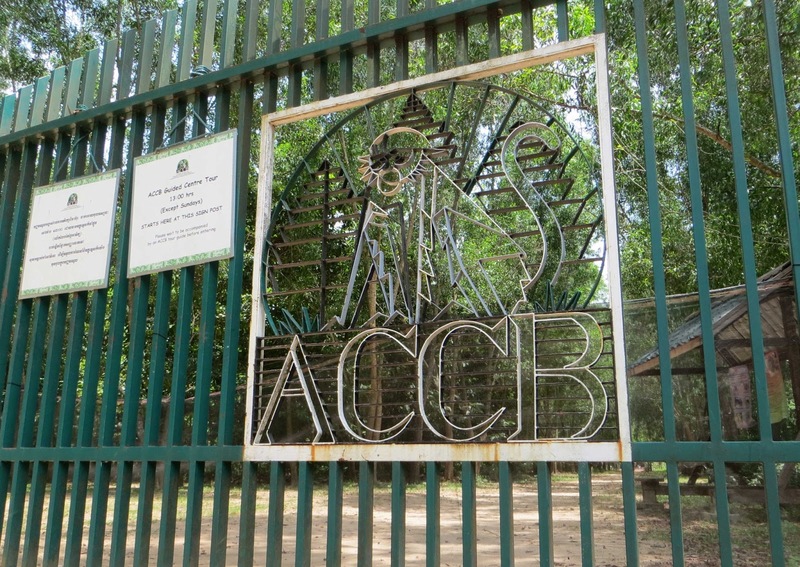 At 1pm sharp, two guides opened the gates and the 90-minute tour began with a brief introduction to the ACCB’s work of rescue and rehabilitation, care, conservation and education. Our main guide was a Khmer whose English was okay, though heavily accented, so he was sometimes a little difficult to understand. And his understanding of English was not good so after a couple of attempts at asking questions, most of our small group gave up. The other guide was from New York but had only arrived at the Centre a week previously so was himself still learning. The centre houses creatures that are handed in by locals when found sick or injured, or by police and other officials when confiscated from people who have kept them as pets or captured them to eat. 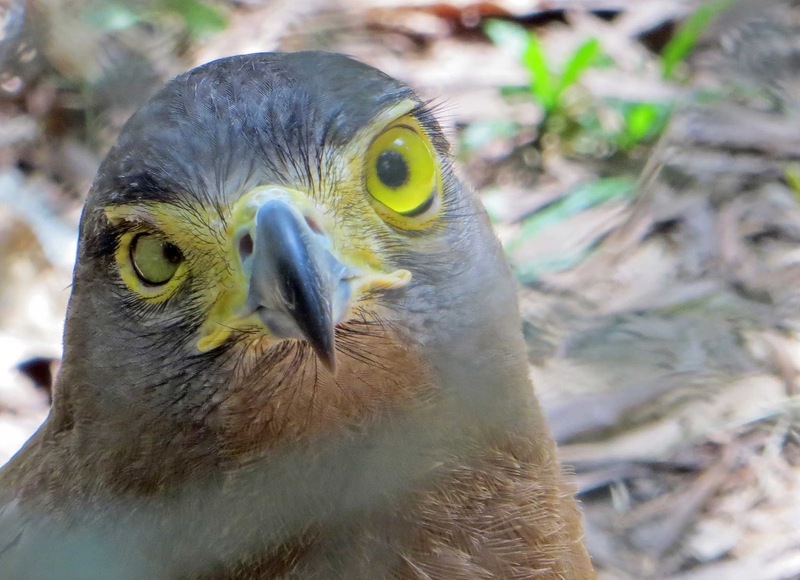 As often as possible the animals are rehabilitated and returned to the wild, as the area surrounding the Centre is part of the Phnom Kulen National Park so is, in theory, free from hunters. 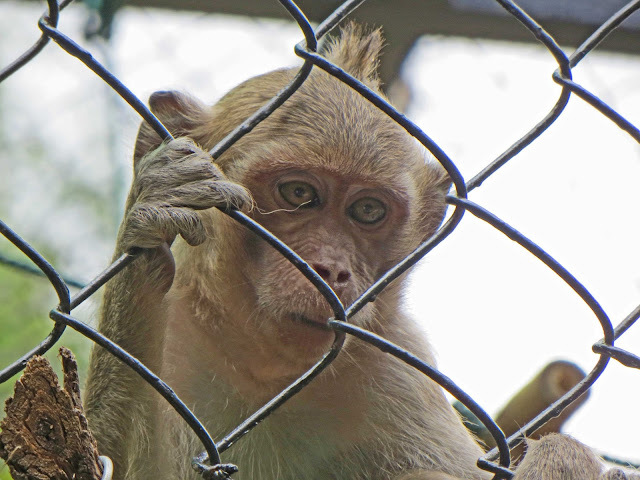 In some cases, rehabilitation is not possible so those animals find a permanent home at the Centre. They may then become part of breeding programmes attempting to increase local wildlife populations. 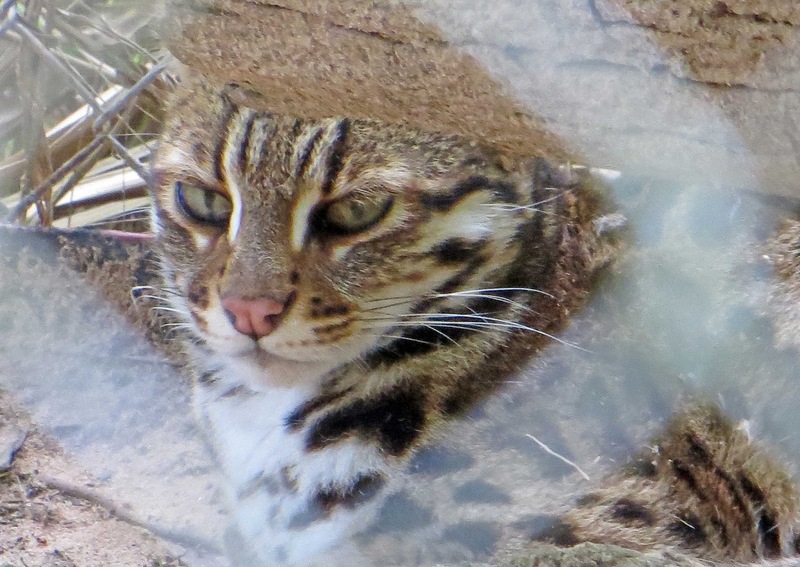 We saw two gorgeous Leopard cats but their three most recent kittens were growing up away from public view and being feed live food (like mice) in the hope that they can eventually be released to fend for themselves. The ACCB runs an education programme so, as well as these information-packed daily guided tours, they also visit the schools in the 15 villages in the surrounding area to educate local children about environmental issues. 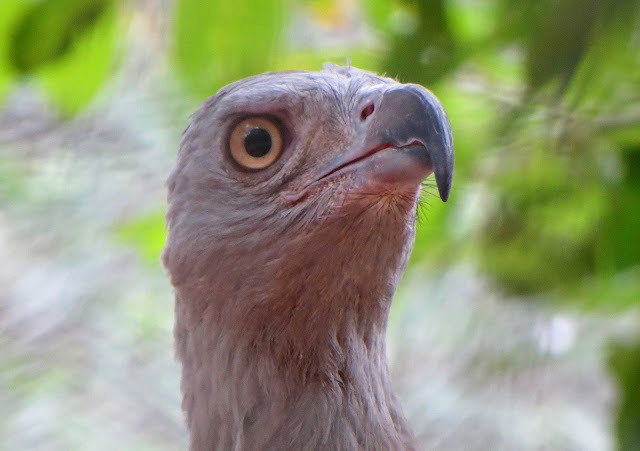 Some of the Centre’s creatures are on the endangered list. Two that I would have liked to have seen are also nocturnal so were sleeping – the pangolin (a scale-covered creature similar to an armadillo) and the slow loris (a very cute, wide-eyed primate). In fact, except for the Leopard cats, which were difficult to see hiding under a log at the back of their enclosure, and a few monkeys – some caged and some hiding in the trees of their more open enclosures – most of the other animals and reptiles (turtles and monitor lizards) were either asleep or hiding, so the easiest creatures to see and take pictures of were the birds. 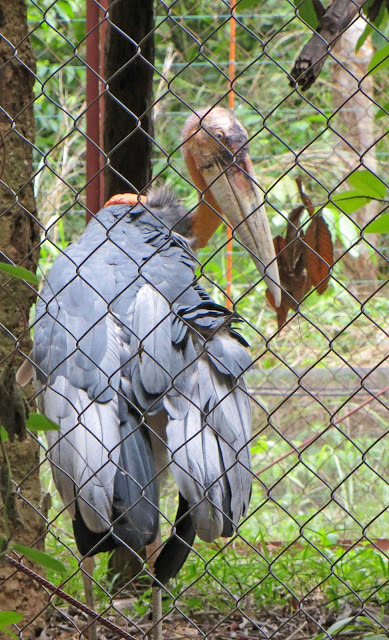 Even those weren’t easy to photograph through wire netting and from behind ropes six feet in front of their cages, using only my point-and-shoot camera, but I did manage to get a few reasonable shots. The magnificent Indian Spotted Eagle kept wonderfully still while staring straight at me; the Grey-headed Fish Eagle cocked his head at just the right angle to show off his dangerous beak; and the Lesser Whistling Duck stood as still as a statue while I recorded its stunning colours for posterity. My photos will act as good reminders of a very pleasant afternoon amongst Nature’s wonderful creatures. Unless otherwise acknowledged, the text and photographs on this blog are my own and are subject to international copyright. British birds: A swan with two necks?